In my effort to make a few more Valentines to send out to my grandkids, I pulled out my Papertrey Ink Cover Plate: Deco yesterday afternoon. I cut one black and one white. I also cut two 4.25 x 5.5 pieces of plain white card stock and ran Tombow Mono Tape Runner all over them. I used them simply as a means of holding everything in place while I inlaid the different pieces back and forth. I pulled every other section of the white die cut out and replaced it with black and then used those white pieces to inlay on the black die cut. This was an easy way to whip up two cards at the same time. It took a little time, but honestly, not much. Maybe 10 minutes and it's like doing a puzzle so I enjoyed it. The sentiment is Avery Elle's Love Die. The white card has a silver foil word and the black one has a red foil word. Both cards have Red Foil Hearts cut from Little B's Stitched Hearts Die in the smallest size. The cutting die is separate from the stitching die so you can leave the stitching off if you want, but I like that look so I use both pieces when I cut the hearts. The hearts were adhered with Thin 3D Foam Squares. I really like both cards but I have to say I love the white one more. I think I would have liked the black one better with a Silver Foil die cut word. The Art Deco style border is such a clean graphic line that I think both men and women can appreciate it. Both front panels were adhered to A2 top folding 5.5 x 4.25 Papertrey Ink 110# Stamper's Select White card bases. It took no time at all to whip these two cards up and I think this means I am done with Valentine cards. I'll have to get my list out in a bit to double check. I hope you're feeling inspired to create some Valentines for the special folks in your life. Thanks for stopping by today. I'll be entering these into the Simon Says Stamp Monday Challenge. I have had a real struggle this year deciding on a design for my husband's Valentine's Day Card. I just started making cards this past June, so I don't have much to choose from in my card making supplies. I'm still not sure if this is "the one" or not, but I like it pretty well. It's not too fussy or glittery which is good. Guys tend not to like shiny & sparkly things near as much as we ladies do and they tend to like really like clean, bold graphics so that is how I came up with this design. I started with a 4.25 x 5.5 inch panel of Simon Says Stamp Schoolhouse Red Card Stock then cut another panel of the same size using the Harlequin Cover Plate from Papertrey Ink with black card stock and adhered it to the red card stock using Ranger Multi Medium Matte. I cut another Cover Plate using Stamper's Select White #110 Card Stock. I popped out all the pieces of the white one and started gluing the diamonds together to create several dimensional pieces to inlay into the black and over the top of the red into selected areas. The diamonds are three layers thick and adhered with Ranger Multi Medium Matte into the pattern you see on the card. The basic design is the same as one I made a few weeks ago but done in a more masculine style. I think that every single time I've ever made something for my husband for Valentine's Day, it has been Deep Red, Black and White. It's a winning combination that works every single time for him. You'll notice that this card is also lacking my sort of "trademark" shimmer as well. It's not called Twinkling Paper Studio for nothing, *Ü*. I cut this Avery Elle Love Die out of Metallic Gold Foil Card Stock and the hearts are the smallest of the Little B Stitched Hearts Die Set. Two of the hearts are popped up on 3D Foam Adhesive and one is adhered directly to the white diamonds. The word is also adhered using Ranger Multi Medium Matte. The photo below will give you a glimpse of the dimension. I've had a Quilled Creations Tip on my Multi Medium Matte for a while now but unless it's a brand new bottle, I have a very difficult time squeezing it hard enough to get the adhesive out. I had ordered a new tip that is a "Fineline" style tip that has the pin that goes into the top to keep it from getting clogged. It's from ScraPerfect and is made for the .5 oz. sized bottles like the small bottle of Multi Medium Matte. I couldn't get the old top off without pliers or the new one on. Thankfully, my hubby was home today to take care of that for me. I'll have to let you know if this tip works out better for me. I really appreciate it when you stop by or take the time to leave me a comment! This week's Simon Says Stamp Monday Challenge is "Love is in the Air" + Use Red, so I'll be submitting this card for that challenge. I have been in a Watercolor Class this week and I was so ready to make a card today when I finished with the lesson. I didn't do much homework but class doesn't conclude until next Friday. It should come as no surprise that when I sat down today to make a card, I chose pink (SU Rose Red) and coral (Simon Says Stamp Teeny Bikini) as my color choices. I grabbed a piece of Canson Bristol Watercolor Card Stock and a couple of Mini Ink Blending Tools. Lots of card makers just use white card stock to do this but I love the way the inks blend on the watercolor paper and I just can't get this good of an effect with card stock. This is about my favorite way to make a background panel. I love the softness and the blend that I am able to achieve by using a bit of water to help the color along. It doesn't take much effort and I don't have the patience to wait and see what happens by dabbing at it with multiple watercolors. I'd love to be able to tell you that the clock face has all those numbers on it, but it doesn't. The stamp set does include each of the Roman Numerals so I carefully stamped them one by one. I stamped 4 at a time, then put the Tinsel Embossing Powder on and heat set it, then moved on to the next 4. I did mess one number up so I scraped it off with my palette knife, put more powder tool on it and re-stamped it. I can tell where it is, but I'm pretty sure no one getting a handmade card will notice. They just enjoy the fact that you think enough of them to spend the time making a card. The sentiment on this card is also two separate pieces so I laid the stamps face down on my card to see where they would fit, then picked them up with my acrylic block and stamped them in Versamark, again using Ranger Gold Tinsel Embossing Powder to heat set them. The hands of the clock are included with the stamps but I also got the Hands of Time Dies which are slightly larger, so I cut them with a scrap of Metallic Gold Foil Card Stock. I cut my background panel with my favorite Simon Says Stamp Stitched Rectangle in the largest size and started assembling everything. In photography, there is the rule of thirds that you should pretty much always use and I've found the same to be true in card making. So my clock time is set using the rule of thirds. For whatever reason, this is the most visually pleasing to most people. I poked a hole at the center of the hands for a tiny gold brad then mounted the background panel onto a PTI Stamper's Select White A2 card base. This certainly isn't the most difficult card I've ever made, but I love how it came out. I also love that it is flat for mailing. I tend to mostly make things that are easily mailable so that I can send more cards rather than spending a fortune on postage and not being able to send as many. Everyone loves to get a personal note in the mail. This is an irrevocable truth. I'll be entering this card over at the Simon Says Stamp Wednesday Challenge Blog this week for the "Anything Goes" Challenge. I still have a few valentines to make so hopefully I'll be back here with one or two more before the weekend is over. Thanks for stopping by today. I hope everyone has a fantastic weekend! My card for the blog today is one that I water colored before the class I'm in right now. I water colored a piece of 140# Canson Watercolor Paper using Red #31 in the Kuretake Gansai Tambi Watercolors Set. I chose that color because it has a more orange-y tone and most guys really like Orange. I used a #8 Round Silver Black Velvet brush for this. It was pretty saturated with color and water, so I had to just set it aside to dry. After a couple of hours tending to other things, I came back and put a spritz of water onto my Finetec Gold Palette in the color Inca Gold which is the warmest gold color in the palette of 6. Using the same brush as before, I dabbed the gold paint on over the red very randomly and then left that to dry while I continued with other things (a.k.a. Laundry, Housework or Dinner). When I came back, the gold watercolor paint had blended with the red and made a very marbled look on the card stock. To enhance this look, I ran that piece of card stock through my die cutting machine with the embossing pad and a clean, unmarked cutting plate. If you use a plate that has any marks on it, they will be left behind on your card stock. It has to be an uncut cutting plate. I discovered this quite by accident when I was attempting to simply flatten out a piece of watercolor paper on a previous occasion but using the same paints. And the surface of the watercolor paper really smooths out when you do this as well. I usually do it a few times, increasing the thickness with a piece of card stock for a shim. The maximum number of sheets I've been able to use for the shim is 2 of the Stampin' Up 80# colored card stock sheets. I don't want it so thick it breaks my machine or that I can't crank it through and this has done the job for me. In the Cuttlebug, the sandwich goes like this from the bottom up: A Plate, Card Stock Shim(s), B Plate, Grey Embossing Pad, the water colored piece face up and unmarked B Plate on the top. Run it though, but if it feels too tight in your machine, back it out and remove the shim from the sandwich., then run it again. I usually crank mine through about 4 times. This makes the surface so super smooth you can only imagine and it makes the gold paint look even more like marble. I was unable to capture that in my photograph for you, but trust me, it's there. I started assembling the card by making a standard A2 Top Folding Note Card using Simon Says Stamp Lipstick Red Card Stock. I cut a doily from a Stampin' Up Doily Die I have using metallic gold foil card stock. I could have placed the doily in the center behind the heart but I like the little bit of visual interest that comes from having something unexpected. Next I cut the Avery Elle "Love" Die using more Gold Metallic Card Stock. Then I cut the heart out of the faux marbled paper using the Little B Stitched Hearts Dies. I cut a slightly smaller craft foam heart to put on the backside of the heart giving it dimension without it sagging in the center. You could use foam tape or squares if your embellishment is small enough but for the larger pieces, I like using the fun foam to provide the more stable dimension. This was a simple card as I only had to leave the watercolor to dry while I did other things. Then when it was dry, I created the rest of the pieces and assembled. I'm trying to come up with a few Valentine Card Designs that are more masculine to send to those special fellas in my life - grandsons! I think this is not too bad, but the doily is probably too feminine for them so I haven't decided on one yet. Thanks for stopping by today and I hope you'll be back soon! Way back in early December, I signed up for another Online Card Class so you are likely to see lots of watercolor related images and posts this week. 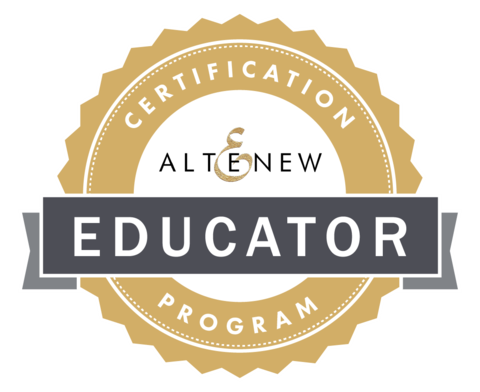 Online Card Classes are a fantastic way to learn with the ease of attending class in your jammies if that's what you want to do. With my time and my schedule, this works for me anytime. I just grab my cup of hot tea as I go through the kitchen and head to my studio first thing every morning. Sometimes my puppy sits on my lap and continues snoozing but more often than not, she prefers to stay in the bed and keep snoozing. Yesterday's class was all about getting comfortable with our brushes and doing washes. Let me just preface this by saying that I am no expert. I love what I learned but I need a whole lot more practice. But I like understanding the mechanics of something in order to do it appropriately. The foundations that were taught were fantastic and the reasons I signed up for the class, after all. This card shares only one of the techniques that we were shown yesterday and I would have to say that initially I didn't think I was going to like mine because it's not "neat" enough for me. I like really clean graphic lines. But once I erased my faint pencil lines it was okay. Not perfect by any stretch of the imagination, but really, okay. It's a whole lot more organic than my usual style. You always have to wait to see what it looks like when it's dry because it will be different. The colors are never quite what I thought they would be when they dry, so it has a bit of a surprise element. Dawn Woleslagle (the Owner/Founder of WPLUS9 Design Studios) is teaching these classes and anytime I can get one of her classes I jump at the chance. She is a fantastic watercolor aritist in her own right. I'm pretty sure that you can tell in this picture that we were utilizing the shape of our flat brush to achieve this Art Deco Style background. Using a T-Ruler we created a very faint diamond grid on this piece. After we water colored and allowed time for drying, we erased all of the pencil lines which made the whole thing look a lot cleaner and neater. We mixed our own paints but I could not tell you what my ratios were for paint to paint or paint to water. Until it seemed to be the right amount of red & yellow to create the coral and then the red. The heart was a "failed" bit of watercolor that I practiced some brushstrokes on and painted again with mostly straight Alizarin Crimson to get that depth of color. I also water colored the edges so it would appear to be a solid color paper from the side. The pink was a very watered down bit of the original red shade. As the lesson intended, I learned more about how much water is needed for the particular technique you are using. There is wet to wet and wet to dry. In the case of wet to wet, you're giving the watercolor a path to travel on by first painting that path with clean, clear water. I haven't mastered this by any stretch of the imagination but I'm beginning to get a feel for it. Like anything that you want to do well, it takes practice. The class doesn't conclude for two weeks so I have several days of class and practice in front of me. I cut the background panel (after it was dry) with the Simon Says Stamp Stitched Rectangles in the largest size. I cut the heart with the 2nd largest in theLittle B Stitched Hearts Die Set. I adhered that heart to a die cut fun foam heart that is slightly smaller than the red heart using Ranger Multi Medium Matte. This helps to keep everything flat when you attach it to your background panel. That's about the maximum amount of thickness I like. Mono Adhesive doesn't really work on the craft foam that I have so the Multi Medium Matte works great for this. With such a busy background, I wanted to keep the greeting very simple. Next, I stamped the heart using Versamark (after it was dry) and I used my powder tool on it to make sure I didn't get any stray particles of embossing powder on it. I used WOW! Gold Rich Pale embossing powder which is a warmer, deeper gold than any others I have. With the soft ivory background and card base, it was the perfect choice for this card. A few glitter hearts cut from a scrap of glitter paper using the Simon Says Stamp Mini Hearts Die and I'm calling this done! The stamp set I used is the Simon Says Stamp All About Love Set. Now I'm off to get my homework uploaded to the class gallery and do some other homework so I'll catch you later in the week with more watercolor goodness! Thanks so much for visiting. Over on the Simon Says Stamp Wednesday Blog, this week's challenge is "Create with Critters". 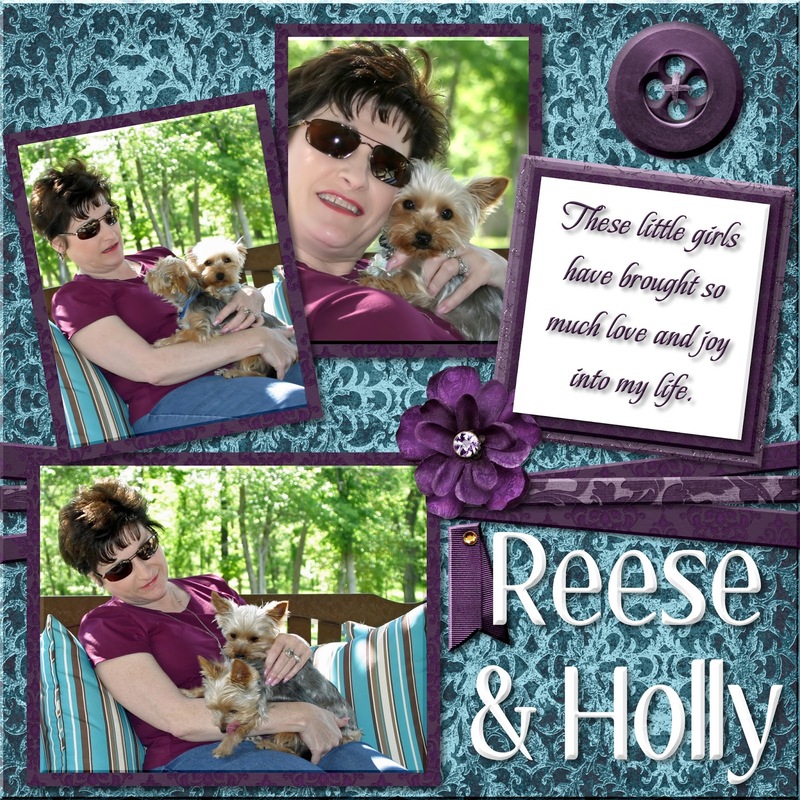 Of course that makes me wish I had a stamp set for my baby girls but so far I have never seen one for Yorkies. In fact, I don't really have cute critter stamp sets and I'm hoping this butterfly meets the criteria for "critters". I was a scrapbooker who went Digital a few years ago but now I am totally into making cards. That's me with my "puppy girls" in the photo. Yorkies have soooo much personality. I've had dogs my whole life but hadn't had any for about 15 years when I decided I wanted a Yorkie two years ago. The 2nd one came six months later so the older one would have a playmate. The reality is that the first one is very jealous and won't play with her sister. They aren't litter mates but they have the same father so they really are sisters. Talk about sibling rivalry..... Oh boy! This image takes my largest acrylic block (4 x 6) because it's so large. It's a cling mount stamp but it has never actually clung and I have to use some Tombow Mono Multi Glue to adhere it temporarily to my acrylic block. I just wash it with mild soap and water after I take it off and that's worked for me so far. I have a few other cling mount stamps that I have never had any trouble with but this brand gives me fits. I stamped this image in Versamark and heat set it using WOW! Metallic Gold Sparkle Embossing Powder. I wish I could capture the beautiful shimmer of this card! My intention was to watercolor it, but I didn't care for the way that looked compared to butterflies that I've seen in real life so I ended up coloring it with my Zig Clean Color Real Brush Pens in Purple, Light Violet, Deep Violet and Cobalt Blue which as you can see is Turquoise and not what I would call Cobalt. My mom has several pieces of Depression Era Cobalt Blue glassware that I've given her over the years it is very blue with no green in it at all. I cut a greeting using the Mama Elephant "Smile" Die from a scrap of Gold Foil Card Stock and adhered it all to a side folding white card base. It was really fast to do except for whatever time I took coloring. I enjoy that process so to me this was a really fast and simple card. I decided it needed a few sequins so I added those. At least I remembered to take a picture before I sealed the envelope! I temporarily forgot that side folding cards don't photograph as well as top folding cards but I managed. Thanks for spending a bit of time here today. I'll be entering this over at the Simon Says Stamp Wednesday Challenge Blog. If you've been to my blog before, you probably know one of my very favorite Simon Says Stamp Inks and coordinating Card Stock is Audrey Blue which always reminds me of Tiffany Blue® (a trademarked Pantone color). 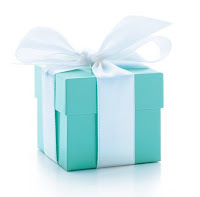 I'm pretty sure that it was so named because of Audrey Hepburn and her movie, Breakfast at Tiffany's. In actuality, Audrey Blue is a much deeper color than Tiffany Blue®. Today's card was inspired by both; Tiffany and Audrey! The Stamp and Die is a set from Papertrey Ink and was a special little kit paying homage to the 1920's. Papertrey hosts an annual event called Stamp-A-Faire. This mini kit was a part of that in 2014 and is listed as "SAF 1920's" on their website. I only recently got this set. The closest city to where I live is Tulsa, Oklahoma and it is known for the fantastic examples of Art Deco Architecture, especially in the dowtown area. I used Versamark to stamp all of my images and heat set them using Ranger Gold Tinsel Embossing Powder. I wanted to compare that to the WOW! Metallic Gold Sparkle Embossing Powder that I've been using. Honestly, the Ranger is very slightly deeper in color but you get twice as much in the container for only $2.00 more. I'll probably buy Ranger in the future. Once I had that done, I die cut the Audrey Blue Panel using the largest Simon Says Stamp Stitched Rectangle Die. I made a Standard A2 Card base from Stampin' Up! Whisper White. I'm almost out of my Whisper White and will be using Papertrey Ink's Stamper's Select White in the future. I got a few packages of that recently and I love the heavy 110# weight of it. I die cut the embellishment from a scrap of Gold Glitter Card Stock and attached it to the panel using foam squares that I had cut in half to fit behind the delicate lines and one in half on the diagonal to fit the points in the center so it wouldn't get squashed. In this photo, it stands a bit more to the side so you can see the shine from the light hitting that sparkle embossing powder. It's just beautiful and so much fun. I don't normally stamp inside my cards, but I wanted this big splashy "Mama Elephant Birthday Wishes" greeting this time. Everyone has their one special day to celebrate and we might as well make it fun, don'tcha think? Thanks so much for stopping by today to see my card. If you'd like to leave a comment, I love reading them. I am going to try to make this post as quick and painless as possible for both of us! I couldn't seem to get my stuff together to pull this card together for a little girl's birthday. I don't know what my deal was but I finally manged to pull it together and get it done so it can go out in the mail in the morning. She's turning 9 on Saturday so I'm late getting this in the mail. She was so excited the last time I sent her something as it was the first time she realized the mail had her name on it instead of her mom's. I remember when that happened when I was little; do you? I know, right? It's the same reaction we have as we get real mail vs. junk mail now. This is one of those things I do to honor the privilege of being someone's friend. I took my girlfriend's first family portrait in the Bluebonnet Field at Frito Lay when the birthday girl was just a few months old in 2007. This particular little girl lost her daddy on Mother's Day in 2013. He was riding his motorcycle the few miles home from work the previous evening and was struck by a car. As I was thinking about this post tonight I found myself wondering if he knew in that instant before impact that he would never see his wife or his 3 little girls again. They were 2, 4 and 6 at the time. He never regained consciousness, so there's no way to know. I figure I can send his girls a birthday card to help take a little of the sting out of their daddy not being there on their special day anymore. Fun is a little out of my comfort zone but I wanted to at least try to make a card that a 9 year old would think was fun. A little pink, a little shine from the gold foil and a few hearts. Trust me when I tell you that my first attempt was perfect for a grown woman but all wrong for a little girl. I hope to do another post about that card a little later. I went to Hobby Lobby yesterday to look for some Arches Watercolor Paper for the class I am taking next week. I didn't have any luck with that as my local store only carries the very large single canvases but I did walk by a little pad of paper that happened to be 50% off this week. I bought the larger 8.5 x 11 pad of this version before but what I noticed about this 6 x 6 size is that the design was scaled down appropriately so I went for it. 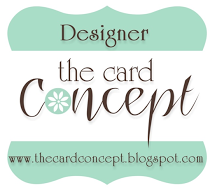 I think it will be great to have for quick cards although I don't seem to do much in my card making that is quick. I messed with this print for a little while trying to figure out which direction it should go. I cut this Papertrey Ink Center Stage Cover Plate Die using Melon Mambo Card Stock and used it horizontally to kind of create the "arrow" in the background. I cut the patterned paper to the exact size I needed and so that the design would be upright. Using the same cover plate die, I ran that piece through my die cutting machine with the embossing pad so it would make the impression but wouldn't cut. When you lay it underneath the top layer, it looks as if it's been inlaid, but with a lot less hassle. I assembled those two pieces using Ranger Multi Medium Matte. It was a lot easier than my first attempt which was to actually inlay all of those pieces. Next I inked up a piece of watercolor paper using Melon Mambo with a bit of Blackberry Bliss then spritzed it with a solution of Perfect Pearls. That really softens and blends the colors. I heat set that so I could go ahead and get my sentiment stamped. This is from the Mama Elephant Birthday Wishes Stamp Set and is one of my favorites to use for a big bold look. I stamped with Versamark and heat set it using WOW! Gold Rich Pale Embossing Powder then cut it with one of my stitched rectangles. I added a little color to some of the scraps from the front panel then cut some little hearts from it. I added those and a few gold glitter hearts from a previous project using Multi Medium Matte and finished putting my card together on a Whisper White A2 Card Base. For the final touch I went over the darker pink hearts with a little Wink of Stella then all of the hearts with a coat of Glossy Accents and set it aside to dry. I think I'm going to have to get a few birthday cards made up to have on hand. It's a lot easier than needing one and trying to come up with a design in a hurry which doesn't work well for me. Now I need to dash off so I can get this in the mailbox but I'm so glad you stopped to spend a few minutes with me today. I love comments if you'd care to leave one. This year was the first time in many years that I did not have a Poinsettia in my home starting sometime shortly before or after Thanksgiving. I wanted to use this image for some of my Christmas cards, but I never got around to coloring one before Christmas so it will have to wait until next year to be used for that purpose. That said, I really love them and they always add a cozy feel to my home and I think they are a perfect cheery winter plant and found in a variety of colors from flaming red to nearly white and there are even some marbled varieties. The "blooms" really aren't blooms at all and are instead leaves that have undergone a color change though photoperiodism. Simply stated, how much light and dark the plant is exposed to affects the color of the leaves. Even the light from a vehicle passing or a television at night interferes with this process and impedes the transformation in color. The more uninterrupted night the plants have, the deeper the red leaves become. At least 12 hours per day for 5 days in a row is needed to change the color. Initially, Poinsettias looked like scraggly little weeds by the side of the road but were eventually cultivated to produce a bigger, bushier plant with all of the many variations of color we see today. The association of the plant (which is indigenous to Mexico) with Christmas began in 16th century Mexico and is said to symbolize the Star of Bethlehem and the red color the Crucifixion of Christ. The Poinsettia was introduced to the US in 1825 by the first Minister to Mexico, Joel Roberts Poinsett. I started with a 4.25 x 5.5 piece of Canson Bristol 96# Watercolor paper that had been stamped with the Stampendous Create-A-Poinsettia and heat embossed using Simon Says Stamp Ultra Fine Detail Gold Embossing Powder. I like this image because it has the holly and mistletoe in the image. I water colored the poinsettia using Tim Holtz Distress Marker in Festive Berries with very little water to keep the red as vibrant as I could. As in other watercolor, the depth of the red is increased by adding in additional layers of color. I used Zig Clean Color Real Brush Pens in Deep Green and Olive for the greenery and Deep Red for the Holly Berries. For the Mistletoe Berries, I used Picket Fence Distress Marker, but ultimately I could have left them with no color on them. It took a few layers to get the red watercolor how I wanted it. I decided to add the greeting after I had already cut the panel with the Simon Says Stamp Stitched Rectangle Die. As you may be able to tell, I nearly ruined the card when I accidentally shifted my acrylic block during the stamping. I decided that it only looks bold and not really messed up so I went ahead and attached it to an A2 card base made from Simon Says Stamp Schoolhouse Red Card Stock. I added a watered down coat of Wink of Stella Clear Shimmer Pen to the berries, then topped them off with Glossy Accents. I added a stitched die cut to the inside of the card as well. It's so hard to read anything on the darker card stocks and the white panel on the inside really fixes that. I'm super happy with my finished piece. 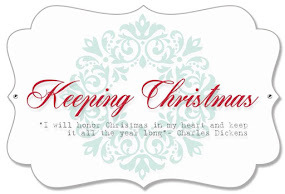 Thanks for stopping by today and spending a few minutes on my blog. I hope you all have a great day! Many years ago I made up a quote that explained my best friend in one neat little sentence, "My best friend is the sister of my heart". It is a long and winding road to get there, but once you arrive, there's no going back. I'm funny that way. Loyalty, love and honor are among the things I most prize in life. I know many people would be surprised to know that my favorite movie is "The Last Samurai" which has more than it's fair share of blood and guts. But the story is all about honor and having the courage to live by your convictions. Not many people do that in this life. People talk a good game, but when it comes to showing you what they are really made of, many people fail to have any sort of honor. I understand that makes them human, but if you've acquired the status of being my best friend, then you've done something to show me that you live as honorably as you know how... that your word means something to you and to me. My husband is as honorable as my best friend. We drift away from people who no longer live near us. That's just the way it is. I'm still not over my husband moving me again in 2010 but there was a lot to leave behind this time -- my daughter and my 2 grandsons and in that time they've added another grandson to the family. It's a four hour drive now and it used to be 10 minutes. And my best friend.... I had to leave my best friend there, too. Although I wouldn't recommend the way we arrived at this place, she and I have a depth of love, understanding and compassion for each other that most people will never have or know. We are fiercely loyal to each other and always will be. She is my sister in every sense of the word. When I was still in Frisco, we had the same doctor and we used to crack jokes about going to our doctor (also a woman) and having her cut our index finger open to mix our blood -- you know-- like blood brothers only blood sisters. She came from Las Cruces in 2000 while I had been a transplant from Kansas in 1997. I don't think we were too sure about each other in the beginning, but our hearts were wiser than we were. Its pretty uncanny how our lives paralleled each other in all the years before our meeting. There is simply no other way to say it except that she is my sister of the heart and that's a whole lot closer than any other human being will ever be. In her honor, I made this card to send her. I started with a 4.25 x 5.5 inch piece of Canson Bristol 96# Watercolor Paper. The Bristol is whiter than the Canson 140# Cold Pressed Watercolor Paper although it is not bright white. It's more of a soft white like Bazzill Marshmallow. I stamped the Hero Arts Floral Background stamp and heat embossed it using WOW! Gold Rich Pale which is a different color than most gold embossing powders. It's a little richer and has a bit more gold color to it - like Brass actually. I always use it when I want to have a hint more warmth to my project. It melts fast and super smooth. I colored in all of the flowers using Worn Lipstick Distress Marker and Zig Clean Color Real Brush Pen in Deep Green for the leaves. One of the biggest surprises to me in learning how to watercolor was how the whole feel of a color changes when you add a bit of water to it. Worn Lipstick seems pretty decidedly pink until you add water and then it takes on a bit of a coral hue. For the skinny strip of gold anchoring the sentiment, I cut a strip of Cameo Coral Card Stock and went over it with Versamark Cube and heat set it using the same, Gold Rich Pale — twice. If you happen to have any of this card stock around, hoard it. It's no longer available and is a perfect match for Simon Says Stamp Teeny Bikini Ink. It's so perfect in fact that I sent a sample of it to a place where I do a bit of business to see if they could get a matching color card stock for their store. Can't hurt to ask, right? And they have nothing remotely resembling this color at the moment. For the Mama Elephant Scripty "friend", I cut three of them from watercolor card stock and adhered them one on top of the other for a thicker embellishment. I covered that with Versamark and heat embossed it three times using the same Gold Rich Pale Embossing Powder. The third time really did the trick as far as giving the word the "domed" appearance. I adhered the gold strip and the sentiment using Ranger Multi Medium Matte and put it all on an A2 card base made from the Cameo Coral. I know that everyone has their own stories and feelings about why their best friend is their best friend. This is mine. Have a great day and thanks for stopping by today. I really appreciate any comments you'd care to leave for me. I wanted to get a couple of really quick cards in the mail tomorrow, so I sat down to work with only a few supplies; SU! 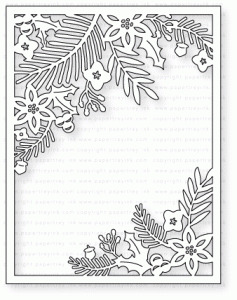 Lost Lagoon & Whisper White Card Stocks, Whisper White Pigment Ink Pad and Cover Plate: Winter Floral Die. I've had a little bit of trouble with getting this particular cover plate to cut all the way through so I wanted to spend a bit of time when I wasn't in a rush to get it done and figure out what I could do to get a better cut. This die is so intricate and I didn't want to lose that detail. I tried several things including the precision metal base plate, card stock shims of varying thicknesses and even plain paper shims. It so happens that I have an older system of dies from Quickutz sitting in a few binders near my die cut machine and as I was thinking about how to solve my problem, I remembered that Quickutz used to include a shim with every die you purchased. So I went to look at those shims and it occurred to me that even though the shim was for a 4 x 4 inch die, I had a nearly identical material right in my studio that I could use to make my own shim. I have a big roll of Scotch 3M Crystal Clear Packing Tape and this material is exactly like those shims I used to get. The width of my roll is about 2 inches, so I put a strip down each side starting from the middle and then a second layer of that material down the center which is where it hasn't been cutting quite all the way through. Oh my goodness -- This worked fantastically well and I am so glad I thought of it. I'll tell you this though, it worked better on thinner 80# card stock as opposed to the thicker 100# or 110# card stock I normally like to use. I just had to be careful not to tear anything, but it came away cleanly. I could still poke out any pieces that were stuck in the die, I just had to poke through the tape the first time for any of the stragglers. After that, it was easy to pull a couple of cards together. One of these cards is going to Northeast Kansas where they have fresh snow on the ground so I just wanted a simple white overlay for a "Wintery" look. Wink of Stella Clear Shimmer Pen over all the white continues that look. It would have been a lot faster to use the Tsukineko Sheer Shimmer Spritz but I didn't remember to do that until after I had adhered the white die cut. It took a little time, but it wasn't too bad since I really wanted to achieve the look of sparkling snow. You can't see it in the photograph, but it's there. I stamped the greeting with Whisper White Pigment Ink and heat embossed it using Simon Says Stamp Fine Detail White Embossing Powder. If you are trying to do a chalkboard technique, this Lost Lagoon card stock is the absolute perfect shade. Papertrey Ink has a similar color called Ocean Tides. Except for the time I spent figuring out a shim, this was a quick and easy card. I have a few really intricate dies that I really struggle with getting clean cuts. They tend to be the ones that are fairly large with a lot of intricate details. Now that I figured out how to help this one, I can go back to those other few and "fix" them up! I created a second card quickly by inking up the Winter Floral Cover Plate die cut with Versamark and heat set it with WOW! Metallic Platinum Sparkle Embossing Powder. Glitter paper would have been too much for this. I put the die cut over my Night of Navy card base using temporary adhesive in just a couple of areas so that I could hold it in place long enough to stamp my greeting with a couple of little leafy stems from the same set. I didn't want to warp the die cut, so I wanted to be able to remove it during the heat setting phase. I love this set of stamps called Graceful Greetings from Papertrey Ink and they have quickly become my favorites out of all the greetings I have. I attached both die cuts using Ranger Multi Medium Matte. I also adhered a white Stitched Rectangle panel on the inside of the card so I would have a place to write my note. 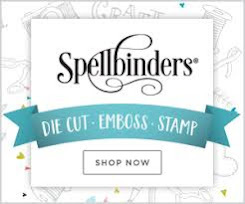 The Simon Says Stamp Stitched Rectangle Dies are currently back in stock! Thanks so much for stopping by today. I will be getting to work on my next project for the Simon Says Stamp Monday Challenge Blog but I haven't posted for a couple of days so I wanted to get a post up this morning. Have a great day everyone! I sat down to make my first Valentine's Day Card today and I was so happy with the technique I used that I immediately had to do it again. I've never sent too many Valentines but I definitely want to send some to those grandkids and to some of my girlfriends this year. Papertrey Ink has several dies that they call Cover Plates. Once the die is cut, it measures exactly 4.25 x 5.5 inches which is the standard A2 size. These can make quick work of making a card. A lot of the time, I use inexpensive card blanks from Hobby Lobby which I don't mind if I'm not having to stamp on it, but they measure 4 x 5.5 so if I want to use a Cover Plate, then I have to use my more expensive card stock for the note card. Since I use the largest Simon Says Stamp Stitched Rectangle on 85% of my cards, that normally fits. When it doesn't, I just pull out a sheet of my good white card stock and carry on. I have a few varieties right now; Bazzill Marshmallow, Stampin' Up Whisper White, and my newest addition is from Papertrey Ink and is called Stamper's Select. It is a very nice 110# paper that has an ultra smooth surface that takes ink very well. At .15 cents a sheet, it is hard to beat. I keep true A2/Invitation Sized Envelopes in Ivory and White for when I use this nicer and slightly larger card size since the others don't fit. I cut the Harlequin Cover Plate from a larger scrap of card stock that I keep nearby for just such an occasion. I wouldn't want to use a flimsy card stock for this, but the kind I normally use is 80# and fine for this. Using a bit of temporary adhesive, I laid the die cut over a piece of Canson Bristol Watercolor Paper and treated it like it was a stencil. Using a Mini Ink Blending Tool, I started lightly adding color in the beginning and then added in more color in a somewhat random pattern. The first time I peeked under the stencil to make sure it was working correctly, I loved how it looked with the Ombre in many of the openings and full color in others but the outlines staying nice and white. I stopped inking up that panel and went to get another so that I could try to ink it up the same "random" way. By doing this, I could pop several of the diamonds up on foam adhesive for a super cool 3D look. I love how it turned out. While you could never get two inked exactly the same, they were similar enough to take the pieces from one and attach it to the other. Anywhere there is a heavy shadow around the diamonds, that has been popped up on dimensional adhesive. I glued four of the "Love" die cuts, one on top of the other and a fun foam heart behind the heart cutout so it would pop out slightly from the rest of the word. A few gold glitter hearts cut from Simon Says Stamp Mini Hearts Die, a little Wink of Stella Clear Shimmer Pen and a thick coat of Glossy Accents over the top of the heart finishes off this card. I hope you like this card as much as I did. With the bold graphics, I'm trying to figure out what color I could do for my husband's Valentine Card this year. I've got a couple of ideas so when I make it, I'll be back to share it with you. Thanks for stopping by today and if you'd care to leave a comment, I really appreciate them! My daughter and now my grandsons have had this lullaby sung to them from their earliest memories. I found the painted image on the Internet and in my mind, that is pretty much the color scheme I always see. I had finished inking my background before I ever went looking for a picture and finding this one just solidified the colors in my mind. The Simon Says Stamp Wednesday Challenge for this week is Ombre which is a French word meaning color with a shaded tonal value such as light to dark or dark to light. I happen to love Ombre although I don't think I do it in a very traditional way since I usually choose to use two colors. For this card, I used a Mini Ink Blending Tool with Wild Wasabi and Baja Breeze Ink Pads working from the outside in to keep it really smooth. I cut the Lily from white card stock so that I could do selective ink blending on it. I simply covered the flowers with my finger to color the leaves. I was being too lazy to cut a mask when my finger was right there, *Ü. 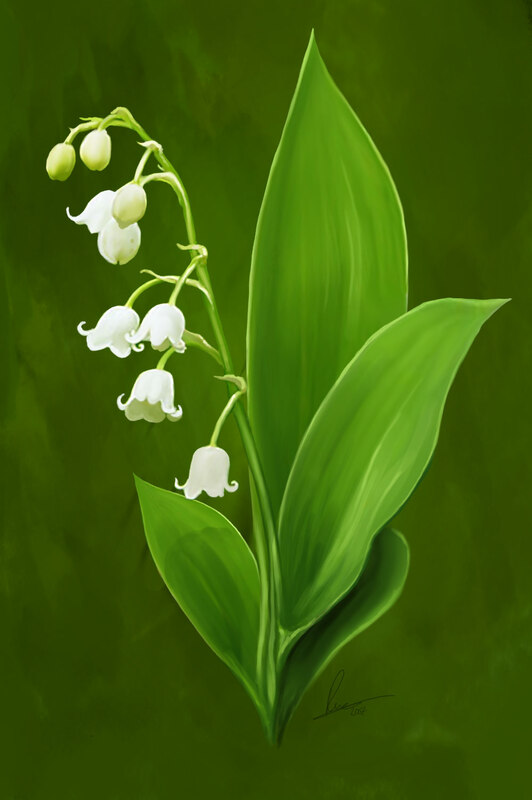 * Lily of the Valley usually come with a big cluster of leaves so I also cut a couple of the Memory Box Slender Leaves (retired) out of the dark green scraps from yesterday's project. Once I had the background panel inked up I stamped the greeting with Versamark and heat set it using WOW! Metallic Platinum Sparkle Embossing Powder. To assemble the card, I cut the background panel with the Simon Says Stamp Stitched Rectangle and began arranging my few elements how I wanted them on that panel. Once I had everything placed how I wanted it, I lifted each one carefully to put some dots of Ranger Multi Medium Matte on the back and repositioned them. With only 4 small elements it didn't take too long. I adhered that panel to a white top folding note card using Tombow Mono Permanent Adhesive. This card is for my daughter and she will be pretty tickled when she gets it. In the meantime, I hear my watercolors calling my name! Have a fantastic day and thanks for stopping by. It means the world to me. I'm pretty sure it's no secret that I love ink blended backgrounds, especially those that have been misted with some kind of shimmer spray like a solution of Perfect Pearls or Tsukineko Sheer Shimmer Spritz. It just makes for the nicest, most well blended backgrounds. I've watched several Periscopes during the last few days while CHA has been going on and I'm pretty sure I heard Tim Holtz say that they were not going to be making Perfect Pearls Mist anymore. I think I heard that they have a mica pigment product now. We'll see what happens as stock is depleted in our favorite stores. I make my own mist from the Perfect Pearls Pigment Powder anyhow but I hope to be able to continue to purchase that item. I started this card with a 4.25 x 5.5 inch piece of watercolor paper. Using my Ranger Mini Ink Blending Tool, I applied Lost Lagoon and Garden Green Ink and then spritzed it with water and let the inks blend and merge. On two other pieces of watercolor paper I inked up the paper directly with the Garden Green and Wild Wasabi Inks with a very high saturation of color and lightly misted with water. I guess you can say that I swiped the ink pad across the paper to get such intense deposits of color. I could have just used green paper, but I don't have the right shade and the spritzing gives it that mottled look. Actually, the look is more like dappling, but I think that is always associated with horses and other animals, so I call this mottled. I used to photograph a beautiful horse that had the most gorgeous dappling on his back. Next, I stamped 6 of the outline images from the WPLUS9 Autumn Leaves Stamp Set and heat set them using WOW! Rich Pale Gold Embossing Powder. The color of this embossing powder is more brass than gold and I think it would be well suited for masculine cards because it isn't nearly as shiny as regular gold embossing. I used the Autumn Leaves Coordinating Dies to cut the leaves. I stamped the peony bloom outline from the Altenew Beautiful Day Stamp Set. That stamp set is a layering stamp set and I tried it out that way today but I wasn't satisfied with the inks I have to choose from and in the end I decided to watercolor the image. Because I wanted a variety of shades of green leaves, I stamped the solid leaf image from Autumn Leaves directly on to my background panel and then started adhering the die cut leaves on top of that. You can see that on a couple of those pieces, I didn't get the die lined up very well, but I kind of liked the look it gave so decided to go with it rather than not use them all. I like leaves - all kinds and all seasons. Just like snowflakes, no two are the same. And even though there are a few layers of paper, it's still pretty flat for mailing purposes. The bloom was watercolored using Spun Sugar Distress Marker. There are several layers of color because I didn't want to go as dark as Worn Lipstick so I just added color until I felt it was right, but allowed it to dry completely between each layer of color. Then I fussy cut it although I detest fussy cutting. There is a foam dot in just the center of the bloom. I played around with different sets to find a greeting that would fit across in the space I had left using the "Hello" from a Papertrey Ink Stamp Set called Graceful Greetings. I love all of the greetings in that set and I'm hoping to get the coordinating dies soon. You can see that it is a tight fit across that card front but a miss is as good as a mile in this case. I'd really like to try this style of card again only with blue in the background to mimic a sky but this color combination was inspired by Melissa Phillips from the Papertrey Ink Design Team. It's time to start thinking about making a few Valentines so you'll see some coming up soon. Thanks for stopping by today and I hope you have a great day. Yesterday I decided to try something new to me so I whipped out a piece of watercolor paper that I cut down to 8.5 x 11 inches which is four times the size I normally work on. I wanted to try a few new things and make something I could frame and hang in my studio. I didn't want to go any larger than that to begin with as I thought it might be a bit overwhelming. I started with a Simon Says Stamp Harlequin Stencil which is no longer available but there are some others out there. I love Harlequin Diamonds, so I positioned my stencil on my watercolor base layer using a bit of micropore tape to secure it and used Ranger Transparent Matte Texture Paste with a Viva Decor Palette Knife to fill in the stencil. Once I had it filled with a bit of texture, I quickly removed it and set it aside to dry for 10 minutes or so while I washed off my stencil and palette knife. Texture or embossing paste will harden on your tools, so don't wait to clean up until you are finished. I keep Dawn Dish Soap and a scrub brush in the bathroom that is next to my studio for easy access. It's also handy to have there in case you need to wash any of your photo polymer stamps to help restore the stickiness. Next I cut out several of the Simon Says Stamp Clustered Leaves from Watercolor Card Stock and began inking those up using the Direct To Paper Method with Simon Says Stamp Beanstalk Green Ink. Next, I added in some Garden Green ink to get both the lighter and darker shades. Using my Finetec Mica Pigment Metallic Watercolors, I made lots of splatters on the leaves with the Arabic Gold color. That is the most yellow of the set and makes me think immediately of 18 Karat Gold which is quite a bit brighter than 14 Karat Gold. I used to work in a jewelry store -- can you tell? I have a couple of flat boxes that I have the flaps cut off of to make a shallow box for me to do any color sprays or that kind of thing in. I found I was getting too much splatter on my desk just doing it kind of over my trash can, *wink*. I set that box aside and went back to my base layer now that the texture paste was dry. Using a Ranger Mini Ink Blending Tool I started randomly inking up my background with Simon Says Stamp Audrey Blue Ink. I was concentrating that color near the center of the image to convey a blue sky in the background. Simon Says Stamp Thistle Ink was then added in somewhat selectively to sort of give the illusion of flowers out a window against the blue sky. I actually don't really know if I achieved this result, but this was the impression I was trying to give by using the Harlequin Diamonds which always make me think of Tudor style windows. Then came the Arabic Gold spatters on the background canvas. I looked through all of my brads for the flower centers as buttons just didn't seem to suit this project and selected the ones you see in the project. I don't have any idea what brand these are and they are several years old - maybe as many as 10 years old. I wanted the scene to seem like it was a sunny garden so I cut a mask from a scrap piece of card stock and inked it in with some Simon Says Stamp Lemon Chiffon Ink. In the end, I actually painted the sun with Arabic Gold. In the Finetec Paints, it completely covers anything else including the ink I had used in that spot. You can even use them on dark card stock and it will cover. After that I sat down to arrange all of my elements on the background with how I thought I would be adhering them. Once I had them how I wanted I used a piece of Press and Seal over the top to keep the arrangement in tact (mostly) so that I could reassemble it with my adhesive. I used Ranger Multi Medium Matte, placing it on the stems and at the base of any leaves that seemed like they might be at risk for getting torn off. I just kept working from upper left to lower right until I had my arrangement how I liked it. For the final touches I added the butterflies made from vellum and eggplant colored card stock with a couple of glue dots and a skinny strip of 3D Foam tape under the body. I cut the Simon Says Stamp Create Die 5 times and glued them one on top of the other for a very thick and substantial element then adhered that to the canvas using 3D foam tape. I'll be entering this project over at the Simon Says Stamp Monday Challenge which is "Stencil It". I hope you enjoyed my "Out of the Box" project today and thanks for stopping by. If you know me, it goes without saying that I am a big fan of bling on my cards. I've started using the WOW! Metallic Sparkle Embossing Powders quite a bit lately and I love them. In fact, I need to get more to fill my containers a little fuller. I wanted to make sure I liked it first so only ordered a small jar initially. 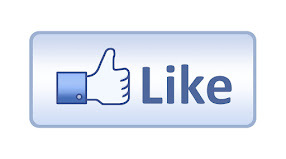 "Like" would be an understatement. 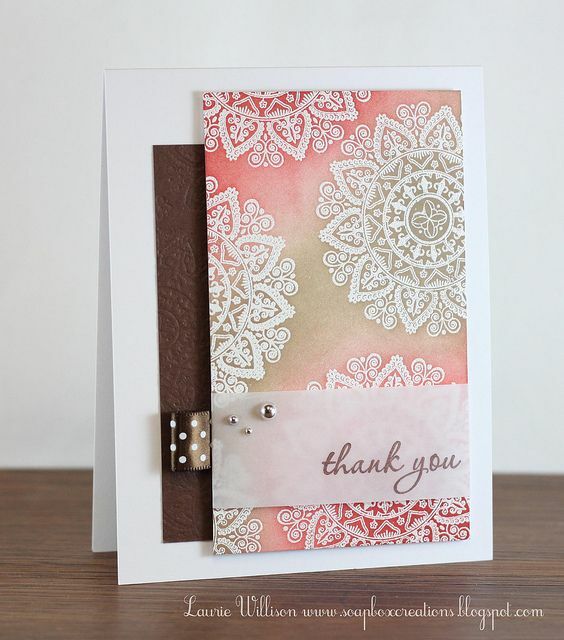 I had pinned this card a few years ago from Pinterest that was made by Laurie Willison with the Papertrey Ink Mehndi Medallion Stamp Set. Mehndi refers to what we commonly call Henna. I love this card and when I checked, they still had those in stock so I ordered one and I sat down to play with it a bit last night. After studying Laurie's card for a minute, it was pretty clear that she had done ink blending on her panel although in her case I think she embossed first so it would resist the ink. Since I planned to use a glittered embossing powder, I wanted to emboss last so I wouldn't knock all of the glitter off in the process of ink blending. On a piece of Canson Bristol 96# Watercolor Paper, I used Simon Says Stamp Teeny Bikini and SU! Crumb Cake inks for my card front with my Ranger Mini Ink Blending Tool in a circular motion. I inked up the center first using the Teeny Bikini and then went around the outside edge with Crumb Cake. Laurie actually used Tim Holtz Distress Inks to do hers, but I just used the inks I had in similar colors. As long as they are a dye based ink and not pigment ink, this works. After I had the ink blended the way I wanted to, I misted it with Tsukineko Sheer Shimmer Spritz and set it aside to dry before I did my embossing. That makes the colors just kind of melt into each other for seamless blending or you can use plain water spritzed on there if you don't want the shimmer. After that dried I used my powder tool over the entire surface of the card to prevent any stray embossing powder particles. This set has several sizes of these medallions in it and there is a Mini Mehndi Stamp Set that has matching/coordinating stamps in it. I stamped the medallions first then heat set them using WOW! Metallic Gold Sparkle Embossing Powder. Then I stamped my greeting which came from PTI's Graceful Greetings Stamp Set and heat embossed it with the same embossing powder. I cut that panel with the Simon Says Stamp Stitched Rectangle Die and adhered it to a top folding Ivory card base. Over all, this was a quick, simple card that is a single layer which is great for mailing. I love the look of layers and my next project will probably have layers, but I have also come to appreciate the CAS (Clean & Simple) style as well for mailing purposes. Since I mail nearly all of the cards I make, that is important to me and this card proves that clean and simple doesn't have to be ugly! I'll be entering this card over on the Simon Says Stamp Wednesday Challenge Blog in the "Something New" category as I used a new stamp set. I cherish each comment that is made here on my blog. Thanks for stopping by and have a great day! 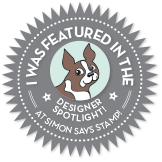 Over on the Simon Says Stamp Wednesday Challenge Blog this week the theme is "Something New" showcasing WPLUS9 Design Studio products if you have any. This gives me the opportunity to play with some standard favorites and a new stamp set I got recently that I haven't had time to play with called "Lucky Stars". There is something to me that is magical about a night sky, especially at dusk. I love it in the warmer months when it gets dark enough to see those first stars sprinkling the sky with their tiny beams of light. If you don't live near a city, the stars are so incredibly bright in the night sky. When we travel up north to the family farm, that's one of the things I enjoy seeing most. I also love to see shooting stars. At home, we live about a half a mile outside of city limits, but still in a subdivision with lighting requirements, so it's not as dark as it is further away from town. I started making my cards by ink blending a couple of background panels using Night of Navy and Blackberry Bliss SU! inks with a Ranger Mini Ink Blending Tool; one to stamp directly onto and the other to die cut a background. Both background panels were sprayed with a solution of perfect pearls and left to dry while I figured out the rest of my design. For the first card, I arranged my greeting and some of the decorative elements on my craft mat and then picked them up with my largest acrylic block which is approximately 4.25 x 6 inches. I stamped them using Versamark and heat set it using Metallic Platinum Sparkle Embossing Powder from WOW! The color of this embossing powder is a bit warmer than Silver and I love the sparkle it gives like the stars twinkling at night. It was the perfect choice for these cards. Next I die cut that panel with the WPLUS9 Scalloped Stitched Rectangle from the Sunshine Layers Designer Dies Set. I had previously cut a Twist Cover Plate Die from some Eggplant card stock so I adhered that to the front of my top folding A2 sized Wisteria card base. Then I adhered the stamped, die cut panel on top to complete that card. I pretty much use the Scalloped Rectangle or the Simon Says Stamp Stitched Rectangles to die cut all of my card front panels. They are basics that I use over and over. For my other card, I die cut the panel with the WPLUS9 Starry Background Die. This die cut doesn't cut an outline, but it cuts different sized stars in your background panel. It's a smaller die so I just repositioned it and cut my background panel twice to get the full effect. Next I layered that over a piece of shimmery white card stock that had been treated with Tsukineko Sheer Shimmer Spritz. I stamped the greeting and the shooting star using Versamark onto a piece of Eggplant Card Stock and heat set it using the WOW! Platinum Sparkle Embossing Powder and then cut the tag using the Love Showers Designer Dies. I love the tag in this die set and use it all the time for gift tags or other kinds of tags. It's a fantastic size and big enough to hold a nice sized greeting being 3 inches wide and slightly taller than 4 inches. I wanted my star shaped brad to match exactly, so using a pair of tweezers to hold it I ran it across my Versamark Ink Pad and then dipped it into the same Platinum Sparkle Embossing Powder and heat set it. To make the moon, I cut a circle from a circle die and then cut a smaller circle lined up inside of it to make the shape of the crescent and went over it with my Wink of Stella Clear Shimmer Pen. Both of my card stocks are very heavy and when I tried to cut the stitched rectangle it did not cut through both layers so I had to use my Tim Holtz Scissors to finish the cuts. Then I assembled all of the pieces onto a top folding A2 Wisteria Card Base using Ranger Multi Medium Matte. I set two large acrylic blocks on top while it dried for a couple of minutes. These cards have pretty minimal layers which makes for easy mailing. I hope you enjoy these cards that feature WPLUS9 Design Studio. Thanks for stopping by and I'll be back with another WPLUS9 product in my next post. I have a few friends right now who are battling breast cancer and today's card is inspired by them in part. I have several styles and colors of glitter in my crafting supplies. I love shimmer and sparkle and I love adding those elements to my cards but glue and glitter can both be sooo messy. I was experimenting a bit yesterday afternoon with a product I hadn't used before, Stick It Adhesive Sheets. One of the really fantastic things about Stick-It it how easy it is to apply to a piece of card stock and also that it is incredibly thin. If you've used any kind of score tape or double sided tape then you know it can sometimes be a thick little bubble of adhesive on the surface of an intricate die cut and glue is equally bad in small areas, sometimes squeezing out in between the layers of card stock and making a big mess. Stick It Adhesive Sheets have been around for a little over a year and were huge at CHA 2015 last January. Having tried it out, I can certainly see what all the fuss is about. Stick It is a micro fine, but very strong adhesive that has super thin silicone release paper on the front and back sides. Even with that, the whole sheet is as thin as a piece of inexpensive printer paper. One of the really great things about it is that the release paper is incredibly easy to peel away making it a natural choice for intricate die cutting. I was anxious to try this out with another technique, glitter inlay. I cut my Paper Trey Ink Twist Cover Plate (A2 sized) from a piece of SU! Regal Rose Card stock. Then I applied a piece of stick-it to a plain white card stock panel on the front side. I removed the release paper from the front side and I carefully placed my die cut over the adhesive, sandwiching the adhesive layer in between. I really like the Elizabeth Craft Silk Microfine Glitter that I had purchased when my local scrapbooking store went out of business last year, but I hadn't used it because - let's face it - glitter is just a bit of a pain. I took a small spoon and used it to sprinkle Elizabeth Craft Solar Gold Glitter to the negative areas that were showing through and then burnished it using my bone folder. This also prevents the glitter from "falling off". Since I was only using one color of glitter, I did all of this part over a sheet of printer paper so that I could tap any excess off my project and put it back in the jar for next time. It doesn't take much glitter to fill in the negative spaces and I was left with this beautiful background. This is gorgeous but definitely too glitzy for a guy card and really even for most of the women I know. So decided that I would "sacrifice" the large piece by putting it behind another die cut panel to tone it down. Papertrey Ink did a "Make It Monday" card and video similar to this that they called a "Window Screen Card". I cut another panel of the Regal Rose Paper with the Simon Says Stamp Stitched Rectangle Dies using the largest one. Then I took the Heart Dies from Little B, making sure I also included the stitching detail which is a separate piece, and cut the window into the panel. I have several of the dies in this set held together with the stitching part using some Micropore Tape. I've found that Micropore tape will mar the surface of my card stock, but for holding dies together for a single pass through the cutting machine, it is great and I just leave the tape on them when I put them away for the next time. Putting adhesive all around the outside edge of that panel, I adhered it to the glittery panel and this left a beautiful glittered border all the way around the outside. I lined up the center of the heart window to be in line with the center of the background. For my sentiment, I wanted something that would stand out from all of the glitter so that meant Bold Black. I used the word "You're" from the Concord & 9th Being Classy Stamp Set and stamped it using Versafine Onyx Black Pigment Ink with Simon Says Stamp Fine Detail Clear Embossing Powder and heat set it. Next I cut the "Fabulous" from the Totally Fabulous by Julie die set that I received free from Ellen Hutson with my Black Friday order, out of black cardstock. I put that die cut down on my craft mat and inked it up with versamark and coated it with the same Simon Says Stamp Clear Embossing Powder. This gives the die cut a little bit of dimension in the same sort of way that glossy accents does and also made it shiny like the first word. I mounted everything to a 110# top folding white card base. I'll be entering this card over at the Simon Says Stamp Monday Challenge Blog which is "Something New". Thanks for stopping by today and I'll be back soon. In the meantime, by leaving a comment before 12:01 am on January 11, 2016, you have a chance to receive this card in the mail from me. I'll use a random number generator to select the recipient. Have a great day!